If you’re anything like me, every holiday calls for something special to be concocted in the kitchen. What would Christmas be without cookies, Thanksgiving without pumpkin pie, or Valentine’s Day without something sweet and heart shaped? Cutout sugar cookies are fine, but this year I wanted something a little fancier. And I wanted something with strawberries. I have had a craving for strawberries for the last week or so, and I was searching for the illusion of health or nutrition in my treat. so I searched some of my favorite blogs for ideas. 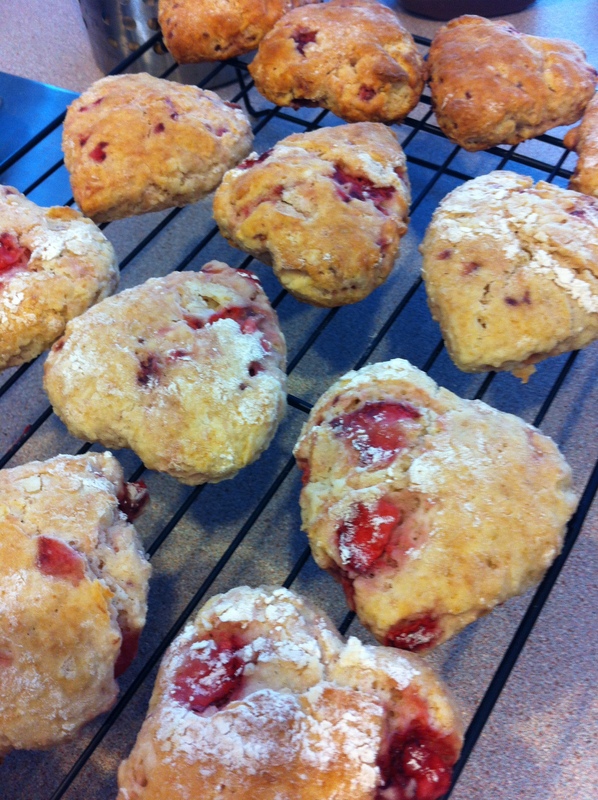 I struck gold with Smitten Kitchen’s Strawberries and Cream Biscuits. 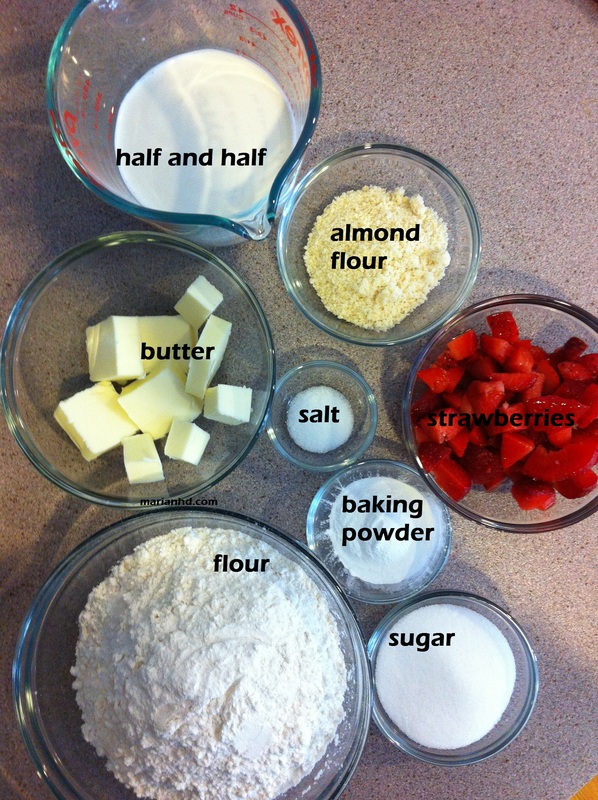 Deb created this recipe out of the need to use up fresh strawberries. In February in Ohio there is no excess of fresh strawberries, that’s for sure. I wondered if frozen strawberries would work as well. I thought about dried strawberries. Since I couldn’t find dried strawberries at the grocery store, I decided to give frozen a shot. Turns out, it was a good call. Also a good call–subbing a little bit of the regular flour for almond flour. Love the subtle flavor. If your vegan nose turns up at scones due to the requisite butter, try these Vegan Avocado Scones instead. 1. Preheat the oven to 425 degrees. Line cookie sheets with parchment paper. Dice the strawberries into small pieces. 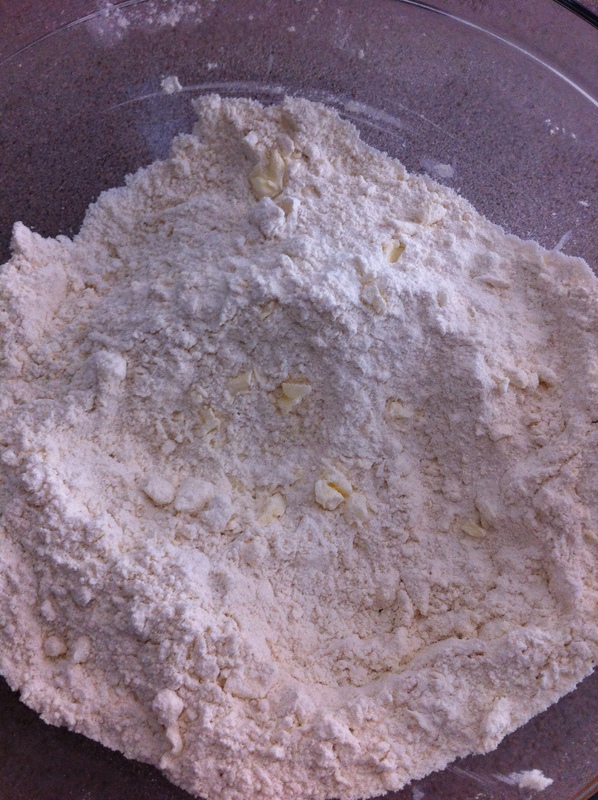 In a large bowl, mix together the flours, baking powder, sugar, and salt. Cut the butter into the flour mixture with knives or a pastry blender until the butter pieces look like coarse crumbs. 2. 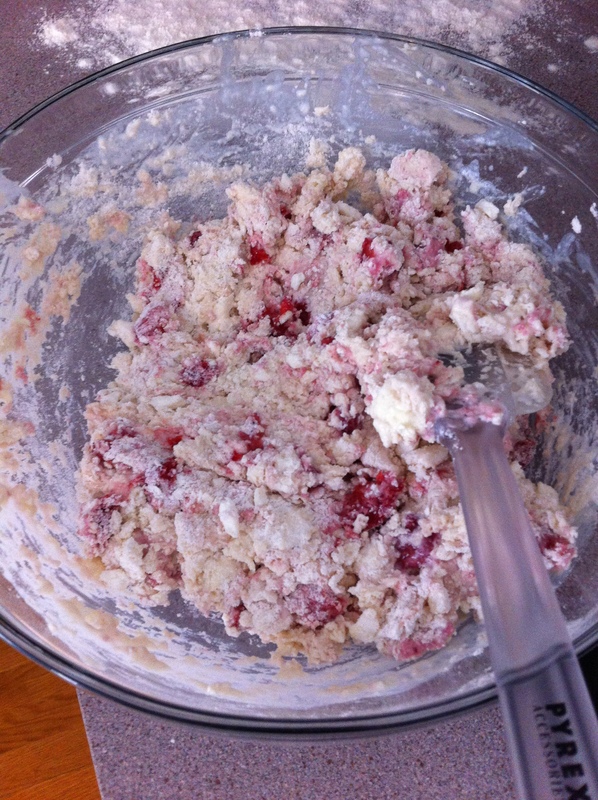 Carefully stir in the strawberries to cover them in the flour mixture. Add the half and half and mix gently by hand until mostly combined. You’ll want to be very certain not to over mix the dough. 3. Generously flour a surface for pressing out the dough. 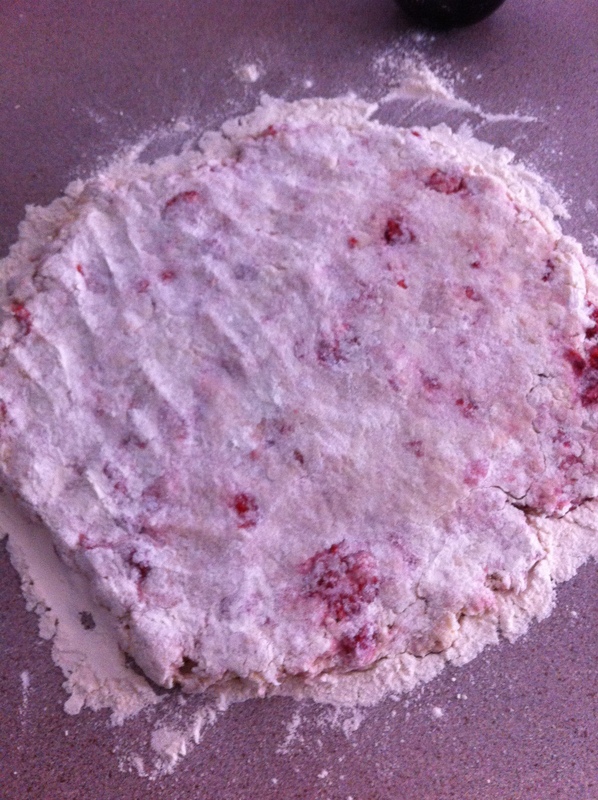 Dump out the dough and press it out to about 3/4 inch thickness. Used a heart-shaped cookie cutter to cut out scones and carefully place them on the prepared cookie sheets with about a couple inches between them. 4. Bake the scones until they are starting to brown around the edges, for about 12-15 minutes. Let them cool on the pan for a minute and then transfer them to a cooling rack. 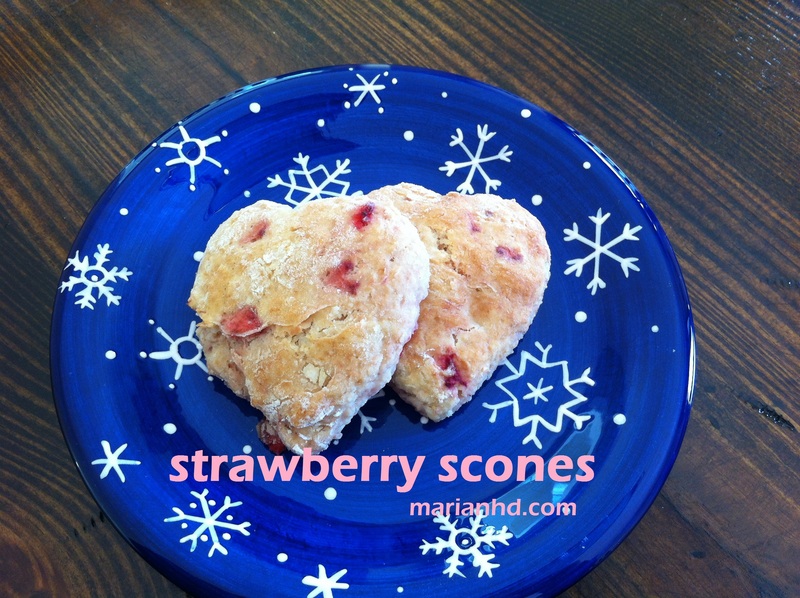 I just love your lovely Valentine Strawberry Scones, how I would enjoy one of those with my afternoon tea. Thank you so much for sharing with Full Plate Thursday and have a great week! The Red Plate looks great! Thank you! I hope you enjoyed the scones.